With the arrival of autumn in India, festivities inevitably embrace you, regardless of whether you’re living the present-day assiduous lifestyle or not. Navarathri, in its essence, celebrates the triumph of good over evil, a theme so universal to all societies, it ought to resonate with anyone who wishes to imbrue the experience. United in diversity, it is celebrated in varied forms with varied traditions, in different parts of India. Durga Pujo is one such festival, that is justifiably eulogised in the Indian states of West Bengal, Bihar and Assam. Having been reminded of my visit to the city of Kolkata amidst its pompous festivities this time last year (2017), I thought my archived photographs could be put to good use. If it’s your first time, it is best to plan your visit on a year when Durga Pujo is celebrated in late October, since the weather may not be on your side before that. Nonetheless, it is the magnitude of involvement and enthusiasm – reflected by the creatively handcrafted Durga idols set up in individual themed pandals spread across the city, along with the swarm of people engulfing you as you try to marvel at them – that will boggle you. Contemporary themes often percolate into this age-old religious tradition where paradoxically, people of all ages, religions, and castes seem to get together to exchange ideas and bond with one another. Pandals in 2017 were made with interestingly varied themes of mythological stories involving Shiva and Krishna, other religions like Buddhism, architecture of South Indian temples, Wat Rong Khun (White Temple, Thailand) and other international monuments, social issue of child abuse, tribal art, mysticism and even theatre and cinema. 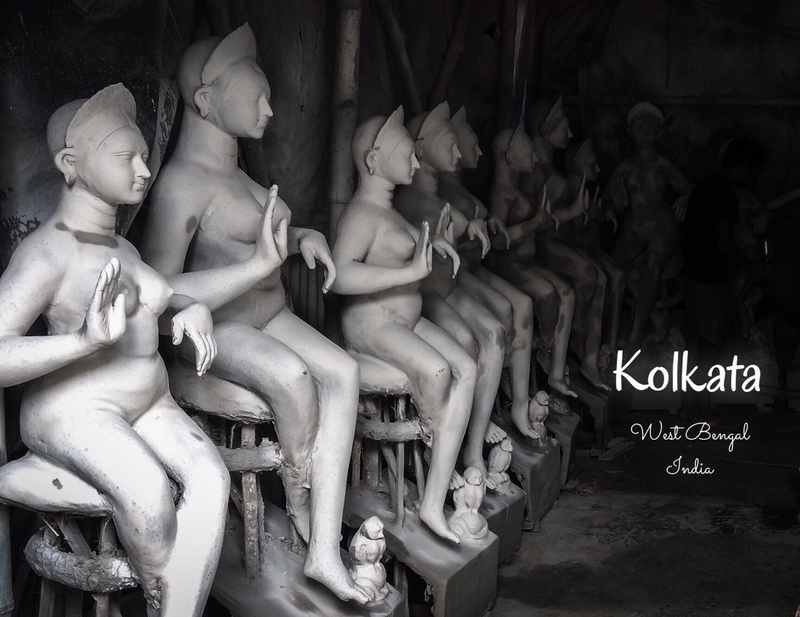 For those interested in delving deeper behind the scenes, the narrow streets of Kumortoli, a sculptors’ hub, would be worth a visit. Idols of goddesses sit in rows, molded, and waiting to be adorned and transformed into the graceful yet powerful symbol of divinity. The celebrations last for 10 days while the Pandals are set up and open to public usually after day 3 or 4. The entire city is shut down for celebrating the last 3 days of Ashtami, Navami and Dashami when the crowd can be sizeable. Avoiding early morning and late evening hours could help you skip the crowd unless you are interested in attending the rituals. There are hundreds of pandals spread across different parts of the city and will need prior planning to visit some of the best ones. Some of the must see ones are- Bosepukur, Deshopriyo Park, Badamtola, Mudiali, Behala pandals, Shobhabazar, Kumortoli Park, College square, Lake town, Shreebhumi, Dum Dum Park. Commuting by Cabs is the most comfortable way but it’s very hard to find one during the festival. Car rentals are available locally. Cycle rickshaws are slow moving and not ideal for long distance travel. Shared auto-rickshaws are available which sometimes have a waiting time. The local buses are comfortable when the weather permits and during off-rush hours. Oh wow, I should go through your older posts then. Creativity always has a charm that draws most of us to it. Thank you Tharun! Will check it out.